I am very passionate about Table Tennis. However after coming to the UK (on 28th May 2007 ), I hardly played TT. This was perhaps because of the lack of ease of finding a good TT partner or a good club near my home. Recently, I came across an advert on Facebook regarding London's first inter company social ping pong tournament. It was called "Pongathon City Challenge". I was quite excited and immediately enrolled and found a doubles partner from my company, as all the matches in the tournament were going to be in the doubles manner. I work for a major investment bank and since I approached my company at the last moment I didn't get complete permission to represent the company as they didn't have enough time to gather all the information they required regarding the tournament. So, me and my doubles partner (Vikash Seth) enrolled under our team called "London Pingpongers". The organisers, Adrian and Steve were very friendly and helpful. Adrian is the founder of Pongathon, which according to me is a place ( in Richmix ( Shoreditch ) ) where people can play all sorts of crazy Ping-Pong games, eat, drink, socialize. In a nutshell - Have a good fun time. Time to time, Adrian and Steve provided us will all the information related the tournament. There were 4 groups and each group consisting of 4 teams. We were in group D. All the matches were doubles. The group matches were held in a round robin fashion, where all teams within a group, played with each other. The 2 teams which won most number of matches would then go forward to the quarter finals. The above mentioned group matches were held in March(1st 2 groups) and 1st May (the rest of the 2 groups). Our group match was held on 1st May. We were up against some very good teams. We quite easily defeated Barclays2 ("Shaka Laka Boom Boom") team and the Fusion team. The Fusion team had a Asian girl who looked like a proper professional player with her outfit and her pen hold grip and a special TT bat for penholders. But luckily we still managed to win :). 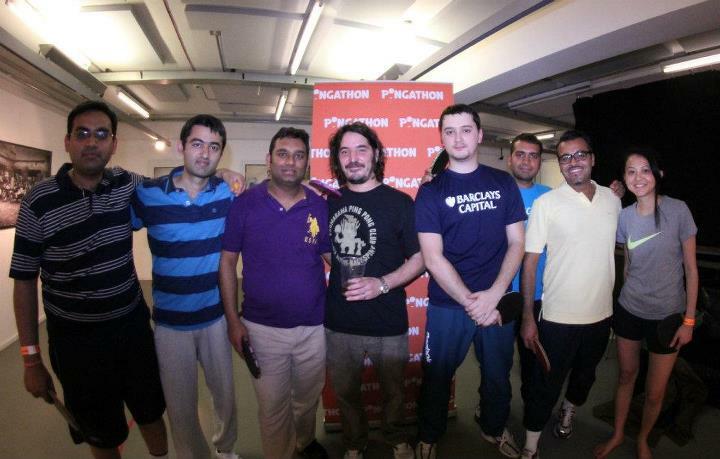 Our 3rd group match between us (London ping pongers) and "Karmarama Silver" was quite tough in which they defeated us. We were upset but not very much because of the fact that we were 2nd in our group and hence would be heading to the quarter finals ! Me and my TT partner were quite pleased with ourselves as we didn't expect to qualify for the quarterfinals as we were out of practice. Thankfully the Pongathon guys had arranged a special practice tables for all the participants before the matches started. We were quite pleased with ourselves and emailed our colleagues about our initial success and requested them to come for the finals to cheer us. The finals were on 15th May 2012 and we were quite happy as this time some of our colleagues from work had come to support us. Our quarterfinal was with "The Double D's". They looked deadly in the their picture posted on the Pongathon site. There were some scary comments about them posted by Steve which made us nervous. I tried to Google the name of their company just to find out if they had any table tennis videos online, so that we could study their game and find some weak points. I found a video on YouTube and I think it was theirs (Not sure though). The video might have helped us to win against them !. It wasn't easy though. I would really like to thank all our colleagues especially Sandesh Gala, Krishna and Sridhar who really cheered us a lot and it really made a big difference ! So now we were through to the semi finals. When we played "Karmarama Silver" in the group matches, we hoped we wouldn't meet them again. But unfortunately we were against them in the semi-finals ! And they defeated us this time as well :((. I am still not able to believe that they defeated us though we were up by 7-1 in the final and deciding game of the semi finals match ! By the way, the quarter finals and the semi finals were best of 3 and the finals were best of 5. The final match was between "Karmarama Silver" and Barclays1 ("Topspin Traders"). I had seen the Barclays1 practice and I thought they would easily beat "Karmarama Silver". However I was proved to be wrong as the final match was a nail biter and went to the full length. In the 5th and decider match, the best player of the tournament from Barclays1 and the whole tournament (according to me), seemed to go fully offensive and ultimately Barclays1 won the tournament. They won a brand new table tennis table and a cheque which they could donate to their choice of charity. I guess the charity was water aid. Many congratulations to them ! I think Pongathon have decided to go for another inter company tournament in which the winners of this Pongathon city challenge (Held in May 2012) will automatically be qualified. We will definitely try and participate in the next tournament and this time we will try our best to win it ! Overall, it was a wonderful experience and I would say Pongathon is a must go place for people who know to play ping pong and also for people who are new to it. They also have a ping pong robot which is very similar to the machine which throws tennis balls which is used for tennis practice. They have many interesting games related to table tennis. More than table tennis it is a place where anyone can come to chill and have a good time with friends.